I attended my third IBS registered benchrest match yesterday and had a great time. 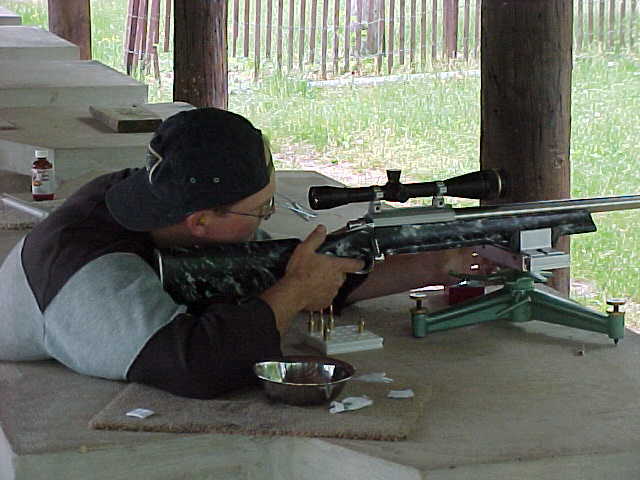 This is the second match that I have shot with my BR gun, which is pictured below with my father in the drivers seat (this is the only picture that I have of the gun right now). The match was held in York, PA and was a 100 yard match for score. The weather was fantastic with a high temperature of 86 degrees and 5-10 mph variable wind. When we first arrived at the range (around 8:45 am), the conditions for shooting were ideal with zero wind. During the open range, the wind was not much of an issue and I was mainly concentrating on getting my zero close to the point of aim. I made only a minor correction with a single click of elevation and a single click of windage. The reason that I was concerned with getting my scope close is so that if the conditions picked up one way or another, I wouldnt have to hold off past the 10-ring or further. I feel more comfortable with as little hold-off as possible. During the warm-up match, I only managed to shoot a 50 1x. I was struggling with the condition, and had a hard time shooting xs. 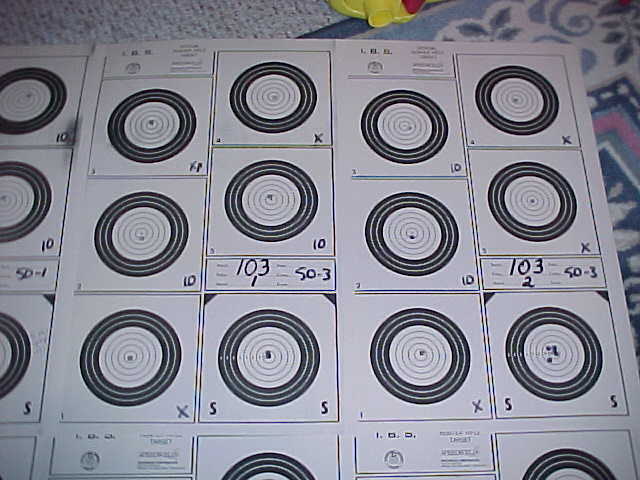 I went to the sighter a few times and shot the center out of the target with the first 2 before I went to the record targets. 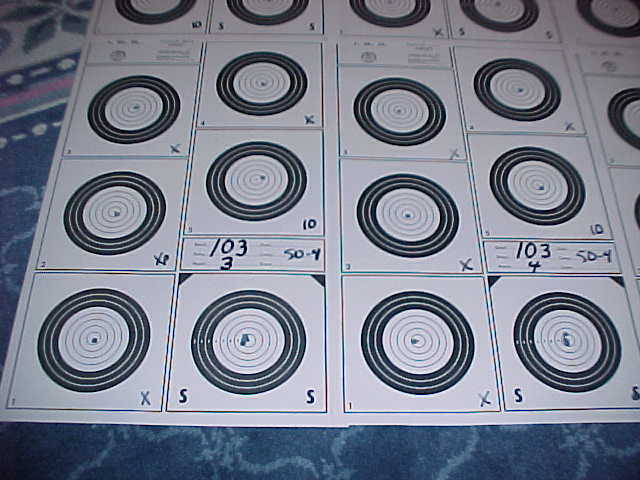 After shooting my record targets, I went back to the sighter target to shoot 3 more into the group. I was so pleased with myself for drilling the x-ring with the first 2 that I figured I would see what I could do with a 5-shot group. 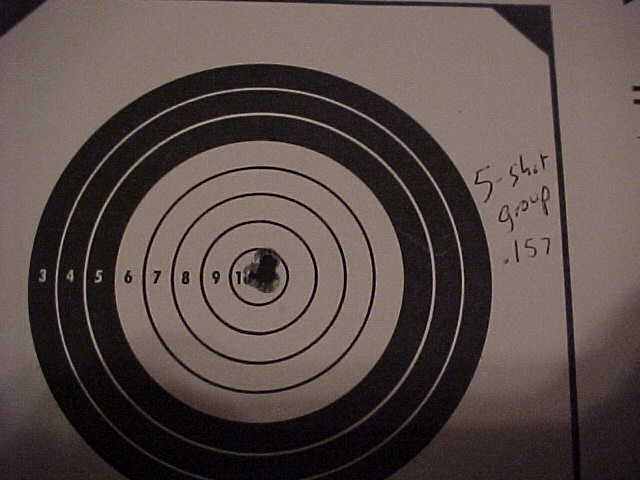 Below is the sighter target and the 5-shot group that measures a tidy .157. 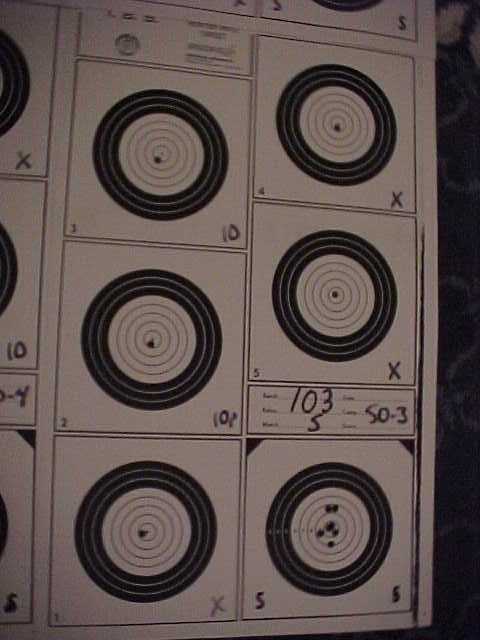 If you notice, I had the first 4 shots into a very small group and the 5th one crept a little high on me. This is my smallest 5-shot group to date. 50-3x, 50-3x, 50-4x, 50-4x, 50-3x, for a total of 250-17x. I was consistent all day and felt good about my results. I finished in the middle of the pack in 9th place. Places 7-9 all had 17xs, but I got 9th place due to my poor start of 3x, 3x on the first two targets. My friends Bill Barwick and Craig Kostyshyn got 3rd and 4th places with 19xs each. Bill actually got 3rd as a result of his strong start. Congratulations to Bill and Craig on their fine performance I have plenty to learn from both of these guys. I really enjoy shooting competitively and have found that benchrest shooters as a whole are good people. The matches that I have attended have been run very well and everybody that I have spoken with has been a big help. I am looking forward to attending the Benchrest School held by the NBRSA in September and will make sure that I take the digital camera and do a full report on it.